Back to a normal evening last night after the excitement of the christmas party last week. There were some nice compliments being thrown around after the interviews were aired on Dal Ati:Bore Da Sunday morning so well done again to @lynnbateman, a star in the making. We won’t be there next Monday for obvious reasons but we’ll be back “on it” from the new year. Well back to saith seren tonight and a good chat with someone new. Even better, another group starting tomorrow in Flint which i hope to attend. Since the loss of Siop y Siswrn in Wrexham after the disgusting decision by our council to close the people’s market Saith Seren have teamed up with a shop from Oswestry (Cwmwl I think) and will have a pop up shop once a month at first to see how things go. The first one will be on Friday afternoon. If you are able please come down to support this new venture. I thought, on TV, they said the closure was temporary, for repairs or development or something! How come they haven’t made arrangements for the stall-holders in the interim? I do hope the pop-up venture is successful! Big turn out tonight. Great chat with @Bob and nice to see @dannywithington too Gave Clive a lift back to Flint and another chance to chat in Welsh. Glad to see pop-up shop on Dal.ati! I missed the cameras by seconds. That would have been Welsh T.V. appearance number 7. I’m working nights young man, it’s the bane of the shift worker. wyt ti wedi colli dy sbectol? It is all a matter of perspective dyn ifanc! I wasn’t working last night so I went along … It was a great night. Only a handful of people turned up last (about 8) night but it made it more personal and we had a really good laugh. Remember … 19:15ish to whenever every Monday night. I forgot to comment on this week’s gathering … Some very interesting conversations and lots of laughs as usual. 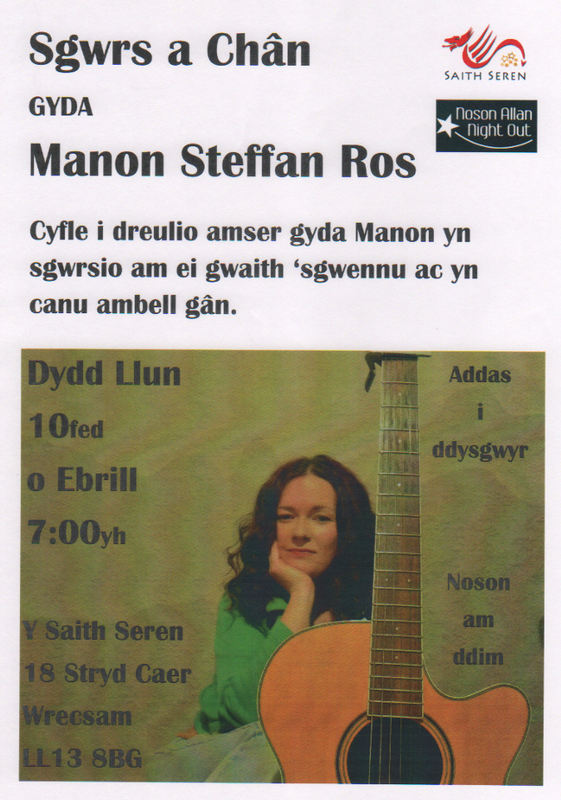 Something very interesting though, I’m currently waiting to hear off a very talented Welsh star in regards to an evening of entertainment here in y Saith Seren. This person is a close friend to SSiW so I’m really looking forward to it. More details (and an open invitation to all) to follow hopefully very soon (as soon as I have confirmation). This week’s gathering was one of the best so far in my opinion. It’s half term this week so as a result all the Welsh classes are off so some of the teachers decided to bring some of their willing students to y Saith Seren to practice a bit. Well, we spotted some fresh blood and descended on them quite mercilessly, eager to have a chat and encourage some Welsh conversation. Really enjoyable. Brilliant! They must have been hugely encouraged! Dysgu Cymraeg and you can join in wonderful gatherings with folk who are really, really welcoming! Further to the teaser a couple of weeks ago we have had confirmation and I’ve knocked up a poster today. Be aware at this stage that this is a first draft so there MAY be a very small charge on the door. Please, please, please come along to this event if you can. Please, please, please come along to this event of you can. Are you thinking of going, Ger? Of course, 100%. I’ve arranged it for one of my days off so I don’t miss it. Oh amazing. Mini bwtcamp this weekend, sgwrs a chân, parti ssiw, another mini bwtcamp.